Abstract: Retinitis pigmentosa (RP) is a group of heterogeneous inherited retinal degenerative disorders characterized by progressive rod and cone dysfunction and ensuing photoreceptor loss. Many patients suffer from legal blindness by their 40s or 50s. Artificial vision is considered once patients have lost all vision to the point of bare light perception or no light perception. The Argus II retinal prosthesis system is one such artificial vision device approved for patients with RP. This review focuses on the factors important for patient selection. Careful pre-operative screening, counseling, and management of patient expectations are critical for the successful implantation and visual rehabilitation of patients with the Argus II device. The Argus II retinal prosthesis system (Second Sight Medical Products, Sylmar, CA, USA) is an epiretinal device approved for implantation in the USA in patients with end-stage retinitis pigmentosa (RP). The device is approved for adult patients 25 years or older with bare light or no light perception vision in both eyes. Patient selection is paramount to surgical implantation, and more importantly, successful rehabilitation and use of the device. In this review, we discuss factors important to patient selection, surgical planning, and other special considerations. The Argus II device consists of three internal components and three external components. The internal components include a coil housed in a sealed electronics case that is sutured to the sclera that serves as a wireless receiver-converting radio waves back to electrical signals, a ribbon of cables connecting the coil to the array or the application-specific integrated circuit, and an electrode array consisting of 60 platinum electrodes (diameter = 200 μm) spaced 575 μm (center-to-center) apart, embedded in a thin film of polyimide, which is secured to the retina-choroid-sclera via a retinal tack5 (Figure 1). The array is in direct contact with the retina, allowing the electrical charges to stimulate the underlying retina. 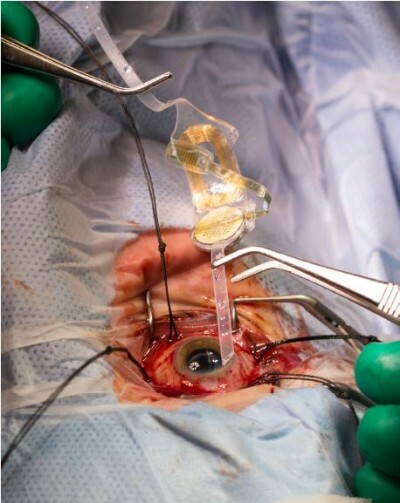 Figure 1 An intraoperative photo shows the internal components of the Argus II device including the coil, the electrode array, and the band which is positioned around the eye. Note: Photo courtesy of Shawn Rocco, Duke Health News and Communications. 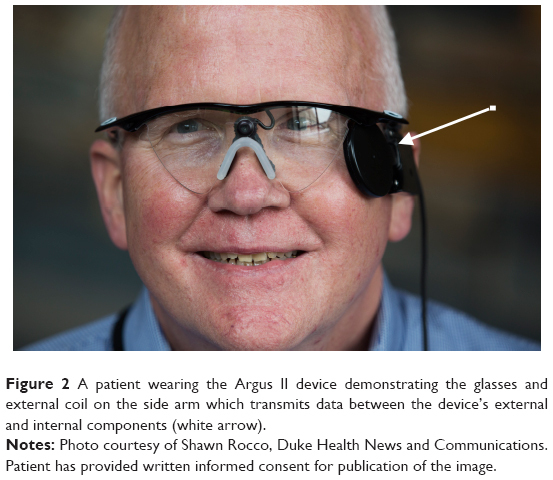 Figure 2 A patient wearing the Argus II device demonstrating the glasses and external coil on the side arm which transmits data between the device’s external and internal components (white arrow). Notes: Photo courtesy of Shawn Rocco, Duke Health News and Communications. Patient has provided written informed consent for publication of the image. Figure 3 (A) Intraoperative view demonstrating the external band and coil sutured to the sclera. Black arrows point to the sutures tied from the external coil to the sclera. The cable has also been positioned through the sclerotomy. (B) Intraoperative view of tacking of the electrode array. (C) Post-operative fundus photo showing a well-positioned electrode array resting on the macula in a patient with retinitis pigmentosa. White arrow points out tack on the array. The Argus II device is currently indicated in the USA for implantation with profound visual loss from RP. Patients must have adults 25 years or older and have bare light or no light perception vision in both eyes. Patients must have a prior history of useful vision. They must be pseudophakic or aphakic at the time of Argus II implantation or require cataract surgery or lensectomy prior to or at the time of implantation. If no residual light perception remains, the retina must be able to respond to electrical stimulation and a dark-adapted flash test6 and visual evoked potential (VEP) testing can be performed. The Argus II is implanted into the worse-seeing eye of the patient. Most importantly, patients must be able to attend post-implant clinical follow-up, device fitting, and visual rehabilitation. There is some variability in patient acceptance of the device after implantation and in our experience, pre-operative assessment of the patient’s ability to participate in visual rehabilitation and the strength of his/her social support network is most crucial for successful use of the device after implantation. Patients must first be screened for the correct diagnosis of RP and those with good vision must be excluded. The patient must have bare light perception or no light perception in both eyes. The screening process involves a standardized survey, history taking, and a complete eye examination. In most circumstances, the screening process involves at least two visits. A full ophthalmologic examination, including an anterior segment examination to note the health of the conjunctiva and sclera to assure no signs of obvious scleral thinning and the status of the lens, is performed. This is followed by a dilated fundus examination documenting the presence of a posterior vitreous detachment, scarring or epiretinal membrane in the macula, retinal tears or detachments, or the potential presence of a posterior staphyloma. Several ocular conditions are contraindications to device placement. The manufacturer recommended axial length parameters are between 20.5 and 26 mm as the available cable lengths will not allow for optimal array placement in shorter or longer eyes. Ocular diseases or conditions that prevent adequate visualization of the internal structures of the eye and posterior segment, including corneal opacification, are contraindications. Patients with a history of optic nerve disease, central retinal artery occlusion, retinal vein occlusion, retinal detachment, ocular trauma, severe strabismus, or amblyopia should be excluded. Finally, patients should be asked about a history of eye rubbing in the pre-operative clinic visit as this can lead to device exposure and erosion. As the patients must undergo general anesthesia for the procedure, the patient’s physical health and ability to tolerate general anesthesia for up to 4 hours must be assessed as well. In addition, the patient must be able to tolerate oral antibiotics and steroids which are taken in the perioperative period. Patients who have metallic or other implantable devices in the head including cochlear implants should be excluded as these can interfere with the functionality of the Argus II device. Similarly, patients must not have hearing impairments so they could hear the device beeping when there is loss of contact between coils or when batteries are low. The Argus II can interfere with the proper functioning of some hearing models and testing the compatibility of hearing aids with the Argus II device prior to implantation is recommended. Patients must be able to tolerate wearing glasses. Most importantly, patients must be willing and able to receive the recommended post-operative clinical follow-up, device fitting, and visual rehabilitation. Any inability to comply with this follow-up and rehabilitation is a contraindication. This may include significant cognitive decline, such as dementia or developmental disability, that may prevent patients from fully understanding or communicating in the informed consent process, fitting of the device, or post-operative rehabilitation. For certain conditions, a pre-operative psychological assessment may be recommended to confirm there is no contraindication to proceeding.7,8 Finally, establishing clear expectations and communicating to the patient about their expectations is crucial. Adjunctive testing is performed during the clinical examination including optical coherence tomography (OCT), ultrasonography, and optical biometry for axial length measurements. OCT is useful in the pre-operative assessment as it reveals the presence of attached posterior hyaloid or an epiretinal membrane and can be indicative of the health of the retinal layers in patients with RP. As the outer retina continues to degenerate in RP, there can also be remodeling of the inner retina.9 The OCT is helpful in assessing the integrity of the retinal layers, the extent of outer retinal degeneration and loss, or potential inner retinal remodeling. Inner retinal layers often maintain their integrity over a longer time period in RP which is essential to functioning of the Argus II device as signals are conducted from the electrodes to the ganglion cells in the inner retina and then to the visual processing system in the brain through the optic nerve.10 The pre-operative OCT can also identify the presence of a posterior staphyloma, which can impact electrode array placement as discussed below. Difficulty fixating or nystagmus may affect the quality of OCT images obtained. Ultrasonography is used to also evaluate for anatomic changes in the posterior wall of the eye such as staphyloma and rule out the presence of masses. Ocular ultrasonography or optical biometry is used to obtain axial length measurements. If the patient has no light perception, the function of the optic nerve and inner retina must be confirmed in order to assure proper functioning of the device after implantation. This can be confirmed with a dark-adapted flash test.6 Then, it further can be assessed with VEP. If the dark-adapted flash test and VEP are negative, the patient is not a candidate for surgery. Family members or a social support network are vital to successful recovery after surgery and the road to learning how to utilize the device. Post implantation rehabilitation is essential to enhance patient’s quality of life and independence. Patients often need encouragement and motivation. Thus, family members should be included in all pre-operative conversations regarding expectations and are often crucial in the rehabilitation process. Those patients that have previously utilized low vision or rehabilitation services and have existing strong blindness skills may be among the best candidates for Argus II placement. Patients are also taught to retain their existing auditory and tactile function skills, and to supplement these with the vision provided by the Argus II. Another factor that needs to be considered during the rehabilitation process is device fatigue and oversaturation. Percepts may get dimmer after extended device use due to adaptation to the electrical stimulation. In our practice, patients are also offered an opportunity to speak with patient volunteers who have previously had the device implant. This has been found to be very beneficial for patients considering implantation. For patients who do not qualify for the Argus II prosthesis at their initial visit as their vision may be relatively good, it may be helpful to suggest re-evaluation as their vision declines. This may give hope to patients who suffer from this progressive degenerative disease. Pre-operatively, the patient is treated with oral antibiotics (fluoroquinolone or equivalent) with a 7- to 10-day course starting 48 hours prior to procedure and finishing after the surgery. Intraoperatively, the patient is given intravenous steroids (1 mg/kg solumedrol or equivalent) to minimize inflammation and intravenous antibiotic (ancef or cefazolin 1 g or if a penicillin allergy present then clindamycin 900 mg is used). If the patient is phakic, phacoemulsification or lensectomy is first performed with or without placement of an intraocular lens. If the patient is left aphakic, all lens capsule material should be removed to prevent a scaffold for anterior membranes, ensuing hypotony later, and to avoid the need for any laser procedures later. This is followed by a single inferonasal relaxing incision (avoid cutting temporal conjunctiva to keep it intact for coverage of implant) and a 360° conjunctival peritomy with isolation of the four rectus muscles with silk ligatures. The encircling band is then threaded under the recti muscles in a manner similar to scleral buckle placement and is held with a Watzke’s sleeve. The electronic case is positioned in the superotemporal quadrant. This is a critical step as the coil is positioned and sutured at the tabs on the band at a location specified by an axial-length–related measurement (Figure 3A). This step is important for optimal positioning and alignment of the band and electrode array over the macula. Care must also be taken during each maneuver not to cause damage to the electrode array and cable, which are outside the eye at this time. Next, a standard 3-port pars plana vitrectomy is performed with removal of the vitreous. Triescence may be used to help visualize the vitreous as it may be particularly adherent in patients with RP. The vitreous base is shaved, paying particular attention to the superotemporal quadrant through which the cable will pass. Any pre-existing epiretinal membrane if present should be peeled; however, internal limiting membrane peeling is not advised as to avoid any tears in the macula or detrimental effect to the inner retinal health. Prophylactic 360° laser retinopexy to the periphery is not recommended. In cases of retinal tears or localized detachments observed intra-operatively, laser retinopexy away from the array and gas tamponade have been successfully used. Similarly, in cases of retinal tears or localized detachments observed post-operatively, laser retinopexy has been successfully used away from the array without change in electrode function. The array is then inserted through a full-thickness 5.2-mm sclerotomy using silicone-tipped forceps. A 20-gauge sclerotomy is then needed for the tacking tool. The array is then held in position, and after raising the intraocular pressure, the array is positioned and secured in the center of the macula using a retinal tack which penetrates the retina, choroid, and sclera (Figure 3B and C). Intraoperative OCT imaging is helpful in surgical guidance of array positioning and during securing.16,17 It allows for the best approximation of implant over the retina with shortest array to inner retinal surface distance, which is important in functionality of implant. The use of processed pericardium Tutoplast (IOP Ophthalmics Inc., Costa Mesa, CA, USA) or temporalis fascia autograft32 or a corneal patch graft over the electronics case and coil is critical to decreasing the risk of device exposure. The use of a scleral flap along with temporalis fascia autograft prevented any cases of hypotony and conjunctival erosion in one series.20 In addition, meticulous closure of Tenon’s capsule and conjunctiva may ensure against dehiscence. As conjunctival erosion, dehiscence, or infection can occur at any point during the lifetime of the device, patients need to be counseled on the importance of long-term follow-up with at least yearly examinations. Patients with abnormal posterior curvature of the eye wall may not be ideal candidates for Argus II implantation as optimal signal transduction between the array and retina relies on good contact with the retinal surface (Figure 4). Several studies have shown that the retina-to-electrode distance significantly affects device function and visual thresholds.22–24 Increased retina–array distance in staphyloma has also resulted in reduced sensitivity to electrical stimulation and in some cases, failure to generate electrophosphenes. Figure 4 Post-operative optical coherence tomography shows a well-positioned electrode array in close apposition to the retinal surface. Note: The image on the left is the en face view with a green line showing the position of the OCT B scan seen in the image on the right. Though patients with significant aberrations in posterior eye wall curvature are not ideal candidates for Argus II placement as complete apposition of the device to the retinal surface may not be possible, these patients still obtain improvements in visual function.25 Thus, a conversation with the patients regarding the increased challenge of the surgery and expectations for potential need for repositioning is recommended pre-operatively. In these circumstances, intraoperative OCT guidance may be particularly helpful in visualizing and optimizing axial proximity of the implant to the retina during tacking16,17,26 (Figure 5). Other techniques that have been suggested but not yet tried in Argus II implantation include the use of macular buckling or scleral slings in order to improve apposition of the electrode array in patients with staphyloma. Figure 5 Microscope integrated intraoperative OCT images demonstrating the distance of the electrode array to the retinal surface during implantation. Notes: The figure shows a three-dimensional reconstruction of the array (left), a B scan showing the array to retina distance (center), and an en-face view (right). The green line marks the level of the OCT scans seen in the images on the left. These images were obtained through a project funded by the NIH Bioengineering Research Partnership Grant: R01-EY-023039 “Intraoperative OCT Guidance of Intraocular Surgery” (Joseph Izatt/Cynthia Toth). Abbreviation: OCT, optical coherence tomography. About 4 weeks after Argus II implantation, the patient’s device is usually turned on. At this time, the patient begins a journey of learning to use the device and his or her new “sight” in order to recognize objects and shapes and navigate the world with the Argus II. The electrical stimulation from the device is adjusted over several sessions to customize stimulation levels, to adjust the camera position, and to test the implant and each of the electrodes. The device must be fitted and programmed prior to turning the camera on. Using a programming system, the electrodes are assessed to evaluate which ones are able to yield phosphenes at different stimulation amplitudes. During the second session, perceptual thresholds or the minimum current needed to produce a phosphene the patient can see 50% of the time are measured. Then different image processing filters and device configurations are saved to the patients VPU for the patient to be able to use the device in low light conditions, normal lighting conditions, and for detecting edges. After the device is customized for the patient with thresholds to ensure the electric current produces an appropriately bright spot for the patient, the patient then continues to work with vision rehabilitation services in order to learn to use the device. Device programming and fine tuning may be ongoing through this period of time. The patient initially learns eye movement and precept localization awareness and head scanning behavior. This basic training is followed by learning several essential skills both at home and with the help of visual rehabilitation specialists including eye, head, and camera position awareness and movement; microscanning to localize small-scale lights; macroscanning to localize large-scale light; tracking; luminance discrimination; and shape recognition.28,29 Patients must have appropriate goals set prior to this rehabilitation as those who are expecting restoration of normal vision are disappointed and can become demotivated during the rehabilitation process. Thus, setting patient expectation before surgery is essential. In our experience, there are several challenges in visual rehabilitation. The first of these is the ability to adapt due to misaligned expectations as the new visual inputs may be difficult to interpret and learn. Second, over time the patient can develop adaptation to the electrical stimulation making percepts dimmer after long-term use. Finally, patients must integrate the new device input into their current regimen of blindness skills. Occupational and visual rehabilitation specialists are critical in teaching patients how to optimally use and integrate their new device into daily life. Though the power of these studies is limited by a small number of patients, the follow-up studies show an overall favorable risk–benefit ratio of implanting the Argus II retinal prosthesis and demonstrate that stable visual acuity gains can be achieved over 5 years of follow-up. Ophthalmic adverse events are of concern and can lead to further visual loss in these patients; for this reason, the need for long-term follow-up should be emphasized with patients. One concern for the future is that as progressive retinal degeneration occurs, it is unknown how patients with the prosthesis will fare. As a result of photoreceptor degeneration over time, several studies have shown that the retinal architecture undergoes significant remodeling, including the inner retina.30,31 For this reason, it remains to be seen how much useful vision can be achieved by retinal prostheses over the longer term in the setting of ongoing retinal degeneration and remodeling. The Argus II retinal prosthesis system offers patients with end-stage retinal disease the opportunity to continue to navigate their worlds with artificial vision. However, patient selection and coordination among a team of retinal surgeons, device programmers, and rehabilitation specialists is vital for successful implantation and use of the device. Careful pre-operative clinical examination with the use of ancillary testing such as OCT, ultrasonography, and biometry is important to preparing the surgeon for successful and smooth implantation of the device. Thorough history taking and a detailed review of patient expectations at the time of initial evaluation is important for patient satisfaction and successful rehabilitation with the device after implantation. LV received research support from Second Sight Medical Products, Inc. Sylmar, CA, USA. The authors report no other conflicts of interest in this work. Humayun MS, de Juan E Jr, Dagnelie G, Greenberg RJ, Propst RH, Phillips DH. Visual perception elicited by electrical stimulation of retina in blind humans. Arch Ophthalmol. 1996;114(1):40–46. Greenemeier L. FDA Approves First Retinal Implant. Nature. February 2013. Available from: http://www.nature.com/doifinder/10.1038/nature.2013.12439. Accessed January 21, 2018. Humayun MS, de Juan E, Weiland JD, et al. Pattern electrical stimulation of the human retina. Vision Res. 1999;39(15):2569–2576. Luo YH, da Cruz L. The Argus® II retinal prosthesis system. Prog Retin Eye Res. 2016;50:89–107. Machida S. Clinical applications of the photopic negative response to optic nerve and retinal diseases. J Ophthalmol. 2012;2012:1–11. Second Sight Medical Products I. Argus® II Retinal Prosthesis System Surgeon Manual. 2013. Available from: https://www.accessdata.fda.gov/cdrh_docs/pdf11/h110002c.pdf. Accessed January 20, 2018. Second Sight Important Safety Information. Available from: http://www.secondsight.com/121-the-important-safety-information.html. Accessed January 20, 2018. Jones BW, Pfeiffer RL, Ferrell WD, Watt CB, Marmor M, Marc RE. Retinal remodeling in human retinitis pigmentosa. Exp Eye Res. 2016;150:149–165. Yoon CK, Yu HG. Ganglion cell-inner plexiform layer and retinal nerve fibre layer changes within the macula in retinitis pigmentosa: a spectral domain optical coherence tomography study. Acta Ophthalmol. 2018;96(2):e180–e188. Geruschat DR, Flax M, Tanna N, et al. FLORA™: Phase I development of a functional vision assessment for prosthetic vision users. Clin Exp Optom. 2015;98(4):342–347. Jeter PE, Rozanski C, Massof R, Adeyemo O, Dagnelie G, and the PLoVR Study Group. Development of the ultra-low vision visual functioning questionnaire (ULV-VFQ). Transl Vis Sci Technol. 2017;6(3):11. Dorn JD, Ahuja AK, Caspi A, et al. Argus II Study Group. The detection of motion by blind subjects with the Epiretinal 60-Electrode (Argus II) retinal prosthesis. JAMA Ophthalmol. 2013;131(2):183–189. Caspi A, Roy A, Wuyyuru V, et al. Eye movement control in the Argus II retinal-prosthesis enables reduced head movement and better localization precision. Invest Ophthalmol Vis Sci. 2018;59(2):792–802. Finn AP, Tripp F, Whitaker D, Vajzovic L. Synergistic visual gains attained using Argus II retinal prosthesis with OrCam MyEye. Ophthalmol Retin. 2018;2(4):382–384. Finn AP, Viehland C, Carrasco-Zevallos OM, Izatt JA, Toth CA, Vajzovic L. Four-dimensional microscope-integrated OCT use in Argus II placement. Ophthalmol Retin. 2018;2(5):510–511. Grewal DS, Carrasco-Zevallos OM, Gunther R, Izatt JA, Toth CA, Hahn P. Intra-operative microscope-integrated swept-source optical coherence tomography guided placement of Argus II retinal prosthesis. Acta Ophthalmol. 2017;95(5):e431–e432. da Cruz L, Dorn JD, Humayun MS, et al. Five-year safety and performance results from the Argus II retinal prosthesis system clinical trial. Ophthalmology. 2016;123(10):2248–2254. Ho AC, Humayun MS, Dorn JD, et al. Long-term results from an epiretinal prosthesis to restore sight to the blind. Ophthalmology. 2015;122(8):1547–1554. Delyfer MN, Gaucher D, Govare M, et al. Adapted surgical procedure for Argus II retinal implantation: feasibility, safety, efficiency, and postoperative anatomic findings. Ophthalmol Retin. 2018;2(4):276–287. Ahuja AK, Behrend MR. The Argus™ II retinal prosthesis: factors affecting patient selection for implantation. Prog Retin Eye Res. 2013;36:1–23. Jensen RJ, Rizzo JF, Ziv OR, Grumet A, Wyatt J. Thresholds for activation of rabbit retinal ganglion cells with an ultrafine, extracellular microelectrode. Investig Opthalmology Vis Sci. 2003;44(8):3533. Ziv OR, Rizzo JF, Jensen RJ. In vitro activation of retinal cells: estimating location of stimulated cell by using a mathematical model. J Neural Eng. 2005;2(1):S5–S15. Rizzo S, Belting C, Cinelli L, et al. 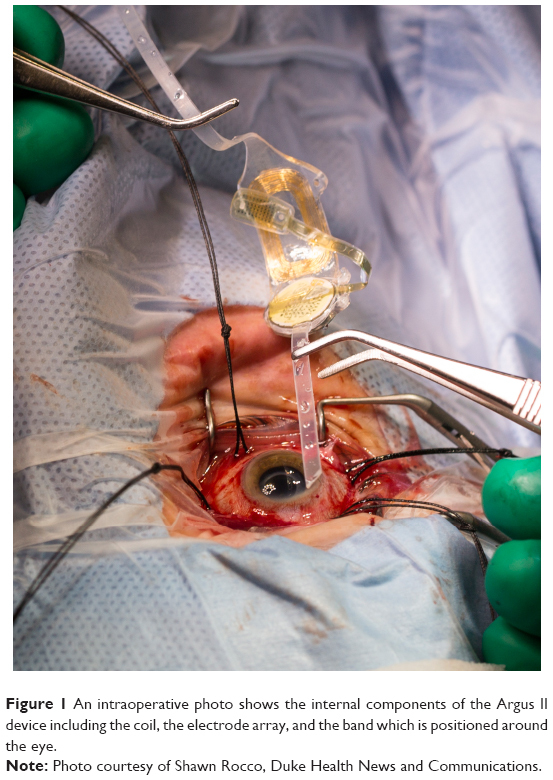 The Argus II retinal prosthesis: 12-month outcomes from a single-study center. Am J Ophthalmol. 2014;157(6):1282–1290. Seider M, Hahn P. Argus II retinal prosthesis malrotation and repositioning with intraoperative optical coherence tomography in a posterior staphyloma. Clin Ophthalmol. 2015;9:2213. Montezuma SR, Tang PH, van Kuijk FJ, Drayna P, Koozekanani DD. Implantation of the Argus II retinal prosthesis in an eye with short axial length. Ophthalmic Surg Lasers Imaging Retina. 2016;47(4):369–371. Ahuja AK, Yeoh J, Dorn JD, et al. Factors affecting perceptual threshold in Argus II retinal prosthesis subjects. Transl Vis Sci Technol. 2013;2(4):1. Dagnelie G, Christopher P, Arditi A, et al. Performance of real-world functional vision tasks by blind subjects improves after implantation with the Argus® II retinal prosthesis system. Clin Experiment Ophthalmol. 2017;45(2):152–159. Dagnelie G. Retinal implants. Curr Opin Neurol. 2012;25(1):67–75. Loewenstein JI, Montezuma SR, Rizzo JF. Outer retinal degeneration: an electronic retinal prosthesis as a treatment strategy. Arch Ophthalmol. 2004;122(4):587–596. Matet A, Amar N, Mohand-Said S, Sahel JA, Barale PO. Argus II retinal prosthesis implantation with scleral flap and autogenous temporalis fascia as alternative patch graft material: a 4-year follow-up. Clin Ophthalmol. 2016;10:1565–1571.